Discovery Publications 2014 Fauquier Edition Page 26 Hard to find page! 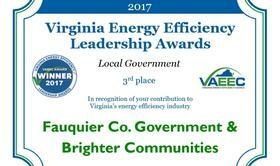 Links to local "Brighter Communities"
Fauquier Government saves *$220,617* - "GREAT for taxpayers"
Saving water in homes - "Less is more"
Power Interruptions Cost 80 Billion Annually (2005)?" JMSWCD: Stream tree planting - "250 in 2.5 hours"
Virginia c.1984: Occupants enjoy more comfort using less energy? No-till farming reduces CO2 emissions - Back to the older ways"
2007: Began www.ThWars.com reducing energy usage / building Note: More than one person in a room often results in arguments over temperature control. 2010: Formed www.Energized-Fauquier.com Energy Conservation / Renewable Energy Technologies Case Studies / Projects to increase local energy awareness. 2013: Founded Energized Research - Learning Institute at www.ER-LI.com and held events (links above) honoring leading edge entities "making a real difference" with "best eco-practices" and recognizing the "Fauquier Top Eco-45"